Tattooing - Know the risks involved! A tattoo is a permanent mark or design made on the skin with pigments inserted through pricks into the skin's top layer. It is done by the use of a hand-held machine which acts like a sewing machine with needle/s piercing skin repeatedly, inserting tiny ink droplets. Tattooing has become a culture that is followed by most of the young generation these days. It is more common now than ever. You may feel getting a tattoo is a cool idea and be proud of it; but don't take it too lightly. 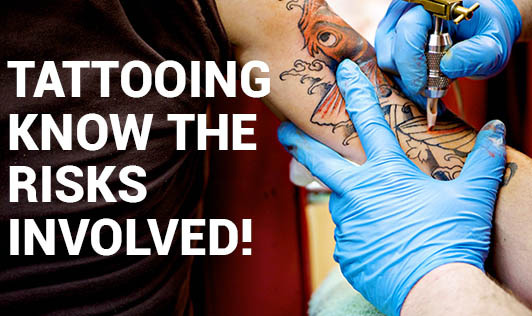 There are risks involved with tattooing, if not done in the right manner. If you take the right steps to protect yourself from the possible risks first, then there are lesser chances that you would regret later. • Allergic reactions: Some of the tattoo dye, especially red dye, can cause allergic skin reactions which leads to an itchy rash at the site of the tattoo. This could occur even years after you get the tattoo. • Skin infections: Tattooing can lead to certain skin infections like bacterial infections. Some of the symptoms of skin infection include redness, swelling, pain and pus formation. • Blood borne illnesses: If the equipment used to create a tattoo is contaminated with infected blood, you can be at a risk of having Hepatitis B, Hepatitis C, Tetanus and AIDS through HIV. • MRI complications: In some cases tattooing can interfere with the quality of the image a Magnetic Resonance Imaging (MRI). For example if you have a tattoo on your back and you if you need to take a MRI of your back due to some health problem, it could affect the quality of the MRI image. • Other skin problems: Granulomas (bumps) can be formed around tattoo ink, especially red ink. Tattooing can also lead to raised areas caused by an overgrowth of scar tissue called as keloids. Some kind of treatment or medications may be required if an allergic reaction, infection or other skin problem develops. In some cases, the tattoo may need to be removed. Tattoo inks are classified as cosmetics, so they are not regulated or approved by the Food and Drug Administration (FDA). So think before you get a Tattoo!